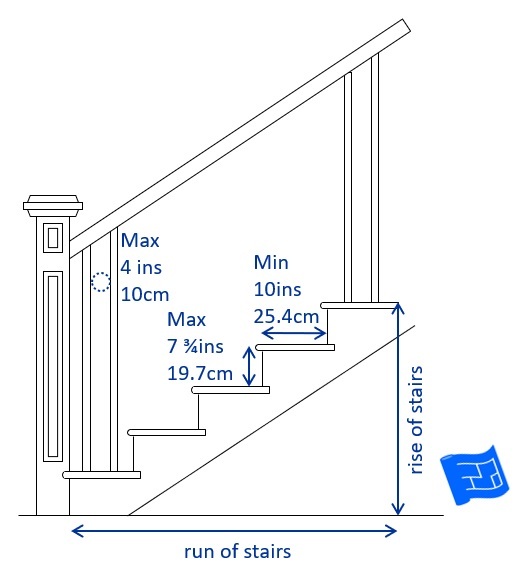 Staircase dimensions are an important part of staircase safety. This page covers all of the important staircase measurements and a mistake to watch out for! This page is part of the staircase design series. The tread size (min 10ins / 25.4cm) is dictated by the average adult foot size, although it is not necessary to be able to fit your entire foot on a tread in order for walking up the stairs to be both comfortable and safe. The riser height (max 7¾ins / 19.7cm) is limited by the way in which we come down the stairs. If you think about it, you could climb up far more than 7¾ inches very easily and you could climb down far more than 7¾ inches very easily if you are facing backwards. The rungs of a ladder are placed at more like 12ins / 30cm apart. But we go down the stairs facing forwards, and it's this that limits the riser size to being much smaller. The maximum dimension between balusters is 6ins / 15.2cm. I don't know for certain what this is based on, but I'm thinking the idea is that it shouldn't be easy to get a foot or arm trapped in between a baluster. Having said that there are plenty of staircase designs where the outer hand rail has bigger gaps or is absent altogether. 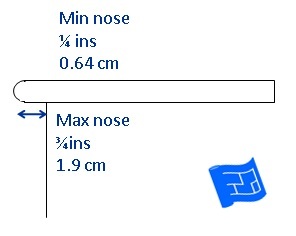 To calculate the run of the stairs, simply multiply the tread dimension (ensure this doesn't include the nose - see below) by the number of steps. To calculate the rise of the stairs, multiply the rise dimension by the number of steps. Or, to work out how many steps you need, take your ceiling height and divide by let's say 16 to start with. If you come up with a riser that's a reasonable size and less than the maximum dimension indicated above you need 16 steps. Try dividing your ceiling height by other numbers until you come up with a riser dimension that works. The nose makes the tread more comfortable to climb in socked feet or bear feet. It mustn't over hang too much or it becomes a tripping hazard. A nose is not an essential part of a tread. There are plenty of staircases, particularly more contemporary designs that are constructed without a nose. 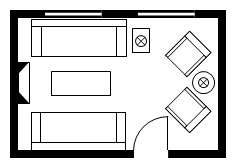 The diagram below indicates the minimum ceiling heights required. These are very much the minimum and a ceiling height approaching the regular ceiling height is more ideal. 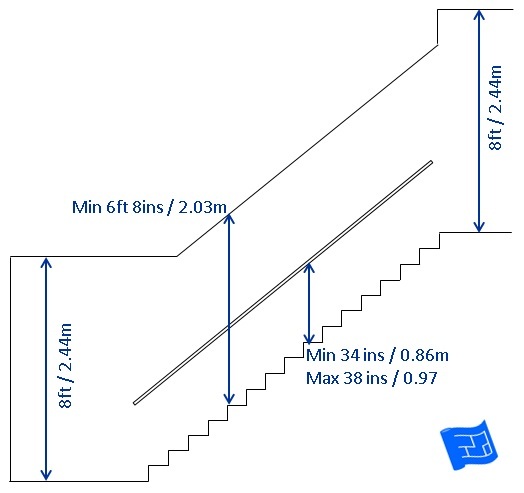 The minimum staircase width is the same as the minimum circulation zone width of 3ft / 0.91m. I've come across several homes where this staircase design mistake has been made. When working out where to put a door that fits under the stairs, the obvious thing to do is to take the door height and work out how many steps need to come before the door can fit underneath. But that would be a mistake because if there's any stair skirt or molding around the door the molding and the skirting will overlap. 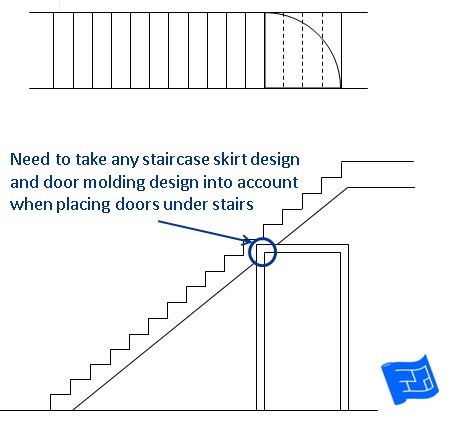 Don't forget to factor in the stair skirt and any door molding when working out where to position a door under the stairs. Here's a picture to help explain.